The Rocks have been told not to rest on their laurels after taking seven points from their first three games and have been warned: There are tougher tests to come. Jack Pearce and Robbie Blake have seen their young side win two and draw one of their opening Bostik premier matches – scoring eight goals in the process, with Pompey youngsters Dan Smith and Brad Lethbridge netting five between them. It’s left the Rocks second in the early league table but Pearce has again warned that the team’s performances so far are ‘nowhere near’ what he is looking for. 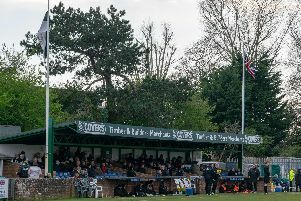 And he expects bank-holiday weekend trips to AFC Hornchurch on Saturday and Lewes on Monday to be stricter tests of how far the new-look Nyewood Lane squad have come. After Smith and Lethbridge had scored a goal each in last week’s 3-1 home win over Merstham, both scored again – Smith twice – as three goals in the final 20 minutes saw them beat Bishop’s Stortford 3-0, also in front of the home faithful. Pearce said: “We’ve done as well as could be expected – the lads have responded well to what we’ve asked of them. But we’re nowhere near where I want us to be. “We’re going in the right direction but with young players comes inconsistency. This is a difficult league – there are about eight clubs, us included, who all have strengths and weaknesses but who have very little between them. The Rocks are upset to have two away games in three days over the holiday weekend – normally they would expect one away and one at home to help revenue and cut down travelling. But Pearce said they must take it in their stride. Coach Blake is also delighted with the unbeaten start but is working to keep the young players’ feet on the ground. “It’s been a good start – back-to-back home wins are especially pleasing – but we have to keep pushing on. I felt confident we could have a good start but a strong pre-season doesn’t always mean you will,” he told us. Blake said he was pleased by Lethbridge and Smith’s goals but also their willingness to work hard on the pitch – a quality he said the whole squad were displaying. “All the lads have been great so far and it bodes well for a good season but it’s still very early,” said Blake. The squad has been further strengthened in the past week with the signing of 22-year-old winger Mason Walsh, who made his bow from the bench against Stortford. The son of former England, Liverpool, Spurs and Pompey striker Paul Walsh, he joins after a stint in the National Premier Soccer League in the USA with New Orleans Jesters. Other new recruits remain possible in the near future. The Rocks have a full squad to choose from this weekend, with Tommy Block and Corey Heath both over bouts of illness and no new injuries reported. They’ll find out early next week who their FA Cup first qualifying round opponents will be on September 8, with the draw being made after this weekend’s preliminary round, in which Pagham visit Newhaven.